Today’s recipe is another from this month’s feature cookbook by The Cook Book Guru, The Book of Household Management by Mrs Isabella Beeton. The 1907 edition significantly added an Edwardian genteel flourish for the upwardly mobile, dressing up what was once plain cooking, and included the affectation of French names for the recipes. In that case, let’s call these lovely little croquettes: Croquettes De Poulet. We really enjoyed the croquettes. There is no strong flavour to them – they are just nice comfort food. Anyone who objects to strong spicy food would love these. Everyone else would find them satisfyingly pleasant. They would be a great addition to a platter at a cocktail party, taken on a picnic or served with some mayonnaise as an entree. I had to adjust the amount of stock and rice used in the recipe and, as I didn’t have any “remains of a cold roast fowl”, I substituted one boneless chicken breast. Otherwise, I stuck pretty close to the original recipe. Steam the chicken breast in a little water until cooked through. Set aside to cool. Boil two eggs, set aside to cool. Once cool, mince chicken breast and eggs in food processor or mincer and set aside. Melt the butter in a saucepan. When melted, add the flour and cook until hot and bubbly. Slowly add the chicken stock and cook until sauce has thickened, stirring all the while. Add the cream and then all remaining ingredients. I thought long and hard about what rice I would use. In the end, I decided that the most likely rice around in the mid-nineteenth century would have been a medium grain rice. The only medium grain rice readily available here is sushi rice so sushi rice it was. Arborio rice would also work well, probably better, really. Don’t use a long grain rice like Basmati which is not at all sticky. The next issues were how much rice and how much stock. I decided on two cups of rice (and I still had filling left over). I followed the packet instructions for cooking the rice using the absorption method. Rinse the rice several times in water (If using Arborio rice, skip this step). Add the rice and stock to a heavy based saucepan. Bring to the boil then lower the heat. Cover pan and simmer, very gently, for 20 minutes. Do not remove lid for 5 minutes after rice has cooked. Set aside to cool. 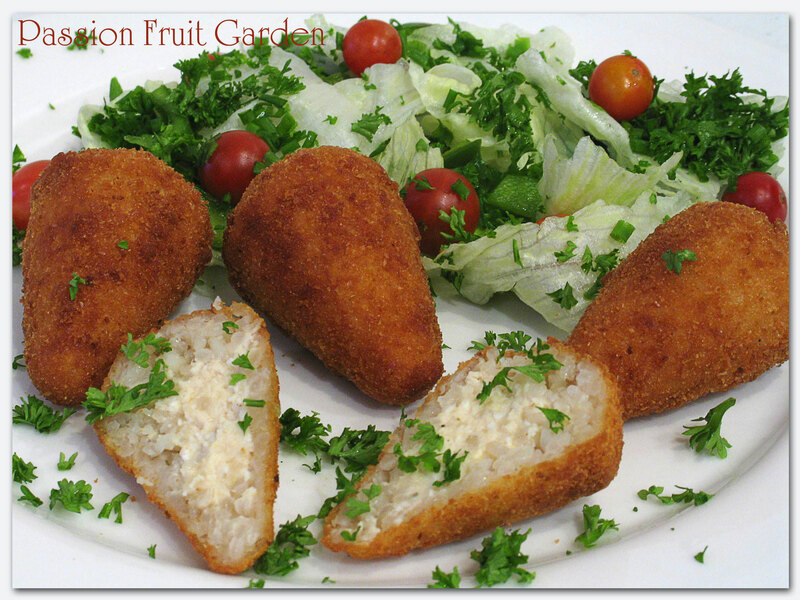 Making the croquettes was easy with our Coxinhas maker. I just spooned some rice into the cavity then pressed down with the stopper to make the hole for the filling. To make the lid, I spooned some rice on top and gave it a press with the other side of the stopper. It is a great little toy if you make croquettes or similar food regularly. If making croquettes by hand, take a golf ball size of rice and hollow it out. Fill hollow with filling and then enclose hole with rice. If the rice is really sticky, you may need to oil your hands. Dip croquettes in beaten egg and then in bread crumbs. Deep fry croquettes until golden brown. We made 33 croquettes and have filling left over. At that rate, if you use three cups of rice and 4½ cups of stock you would use all the filling and make about 48 croquettes. Although, it is not that simple. With one cup of rice, I made 19 and Maus made 14 croquettes. Also, if you make the croquettes by hand, you would probably use more rice. If anyone is interested: a full PDF copy of The Book of Household Management by Mrs Isabella Beeton can be found at exclassics.com. Here is the first volume, here is the second and here is the third. This entry was posted in Chicken & Duck, Pasta and Rice, Patties and Fritters, What's for dinner? and tagged Coxinhas former, Mrs Beeton The Book of Household Management, The Cookbook Guru by Glenda. Bookmark the permalink. My mom, Gloria Davis Bradshaw always loved this classic food. Glad you are putting the Coxinhas maker we gave you to good use. Very impressive as they look just like the ones we ate in Brazil. Congratulations. I’ve never made these before but you explain it so well. I have to say, that Coxinhas maker looks very handy. Guess that’s something to add to my ever growing list of cool tools. Ooh Diane, there so many cool things to have, once you get better, you will have to go shopping. I much prefer your name to the original. That’s a lot of croquettes – I’d love to have some of these frozen in my freezer for emergencies. I’m sure your version tastes a whole lot better than the original. Hi Nancy, I stuck pretty much to the original recipe so they should have tasted similar. Your blog is fascinating, Glenda. I really enjoy reading it. These look interesting and my kids might even eat them. Might give them a try but I would do them as balls – and I have arborio rice in the pantry which I could use. Thanks for the compliment Simon and thanks for leaving a comment. I hope the kids like them. Oh wow! What wonderful British arancini! I’m impressed even if I don’t think the Sicilians would be with bland English cooking. Thanks for the shoutout – Croquettes de poulet does sound a bit more swish! I have the 3 part pdf from the exclassics site – it is really a good digitisation of the original 1861 edition, particularly since it contains the original images which are quite rare. Worth downloading just to compare how the images changed over time – these became more upmarket as well. Hi Debi, I was amazed when you said the recipes went upmarket. Oh well, I prefer the 1861 edition, it is a lot of fun. I am not too worried what you call these – they look fabulous and very moreish. Have a super day Glenda. Hi Mandy, Thanks for stopping by. They look lovely regardless of their name. The sort of thing I would enjoy nibbling at a party, remarking on the skill of the chef… The best I can say about me is at the moment I wouldn’t have the patience. Hi Ella, I think it could be a bit tricky shaping them by hand. The rice was very sticky, that is why I suggested oiling your hands first. I think Arborio rice would be easier to handle. Oh, and thank you. I downloaded the 3 vols of Mrs Beeton’s pdfs – very handy to scroll through – pending finding a lovely vintage copy. It’s time for another contribution to this months The Cookbook Guru. Glenda has made some beautiful croquettes, this time with chicken, in the style of Mrs Beeton’s recipe of “fowl and rice croquettes” recreated with a modern edge. Enjoy. Leah, it is amazing how, once you work out what she wants you to do, the recipes are not that different to modern day ones.